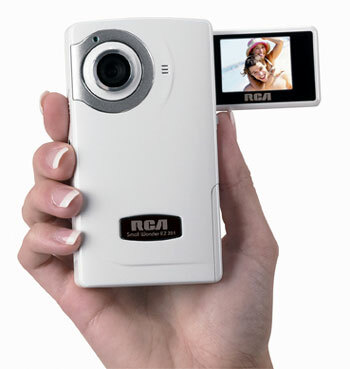 RCA has announced the new EZ201 Small Wonder, an inexpensive digital camcorder designed to make it easy to capture and share video. It joins a growing segment of cheap camcorders, like the Flip Video, designed to offer basic image quality and the most frequently used features of more expensive camcoders. The EZ201 has an SD memory card expansion slot, the RCA MemoryManager video sharing application and a flip-out display. The camcorder is about the size of a deck of cards and weighs 5.25 ounces. The EZ201 retails for $129. The EZ201 offers up to an hour of recording with its on-board flash memory, which can be expanded up to five hours with the addition of an SD memory card (sold separately) that will slide easily into the unit‚Äôs memory slot. Two standard ‚ÄúAA‚Äù batteries provide up to two hours of continuous use (or more than seven hours with optional lithium batteries), making the EZ201 ideal for vacations and travel. A convenient tripod mount makes it easy to insure steady shots. The EZ201 is compatible with Box.net, a secure online file storage and sharing service. Box.net is offering EZ201 owners 1GB of free storage space, equivalent to about eight hours of recorded footage. Box.net users can easily distribute video files with the links to the videos sent over email, in blogs, or on personal websites. Unlike the Flip Video, the EZ201 doesn’t offer special integration with popular video sharing sites like YouTube. The RCA Small Wonder EZ201 digital camcorder ships with a full accessory kit including a wrist strap, a soft carrying pouch, two AA batteries, a USB extender cable, and an A/V output cable to allow easy connectivity to a television.